More goodies arrived today. A couple of days ago I'd been left a card saying that a large parcel had been left for me at the sub Post Office up the road. I knew what it was - my order of matt spray varnish. I collected it this morning, but no pics of that. When I got home there was another small package waiting for me. I'd removed the outer wrapping before remembering to grab my camera. It was the figures I'd ordered from Dixon. A bit of a mixed bag here. Some more "molls", some cops, some casualties, some vehicle passengers, a bunch of down and outs, bootleggers and some gangsters. Eureka! My order for some of their figures from Fighting 15s had arrived. I'm very impressed with the delivery speed. 1920s Ladies - Molls for the wise guys? I really want to make a start on these, but I'll wait until all the Blue Moon figures are done. There's another good reason to hold off on these - I'm out of black primer! A pack of oil drums, a pack of garbage cans, two packs of fire hydrants, 2 packs of wooden pallets, a park bench and a fizzy lemon sweetie. I've placed an order with Ainsty now for various bits from the Trade Goods range, plus a skylight and pigeon loft from the Flatroof range. I'll be picking those up at Broadside next weekend. My order from Fighting 15s have been dispatched so they should be with me in the next day or two. Yesterday's refight of Plataea was a blast. Even though I had the Spartan command. Which needed to roll a 5 or 6 at the start of our turn to begin moving troops (to reflect the historical fact that they were waiting for the entrails of sacrificial goats to tell them it was time to join battle). Lots of goats were sacrificed before I was finally able to start moving my hoplites on our 5th turn. By this time the Athenians and other Greek allies were not inconsiderably annoyed by the Spartan's piety/superstition/willingness to see them being slaughtered by the Persians. Not to mention the Persians were ominously close to outflanking the Spartan battle line. I think we actually managed to play out about 17 turns before calling the result - a narrow win for the Greeks. It was good fun playing with 25/28mm figures and we had some great food courtesy of our host, Gordon. Reflecting on the game afterwards, the "goat sacrifice" mechanism definitely needs to be amended. I'll try to post some pics of the action later this week. I managed to spray these with matt varnish today. I then took pics before I'd gone over parts with brush-on gloss and satin varnish. The pics did highlight a couple of small bits which needed touching up, but I couldn't be bothered to re-photograph them, so here you go warts 'n all pics of the Blue Moon G-Men. The great thing about this little group is that (should I so wish) four of these could just as easily be used as gangsters as only two have their Bureau shields on display. Although my original plan was of just painting these figures to "gaming standard", ignoring awkward things like eyes, this plan went to pot very quickly. Now I'll have to continue it for all the other figures. Curses! I even went back and painted the eyes of the cops. I spent a while this afternoon packing people's prizes and Sgt Steiner for Curt. They will get posted out tomorrow after work. Rodger, Joe and Justin will find a little something extra in their packages along with their gangster figures. I realised on Saturday evening that I was almost out of matt spray varnish, so placed an order for a few more cans. While I was in buying mode I succumbed to the lure of more figures for my Mob Wars project. I've placed orders with Brigade Games, Pulp Figures*, Dixon Miniatures and Fenris Games (for some scatter terrain). I'll also be placing an order for some Eureka figures from Fighting 15s. More scatter terrain is lined up to buy from Ainsty, either at Broadside (maybe as a pre-order) or as a normal web order. I also need to order some foam trays from Figures in Comfort to store all the figures and vehicles. Not to forget the additional buildings I need to order from Sarissa Precision to fill out "New Mornington, Michigan" (the fictional city where my gangster gaming will be set). It's rather scary how much this little diversion is beginning to cost! * I somehow managed to forget to make a note of which 6 packs I ordered. There's not a lot left to do to this building. Just some tidying up of the internal walls and painting the window frames, doors and the stone courses between floors (and on the roof parapet). As Monday is a public holiday (no work! Yippee!) I hope to get this finished over the next couple of days. These are the G-men I began painting last weekend. I haven't made any progress since then, so my plan is to get them as near as possible to finished today. Last but not least are these figures primed this morning and my "Sergeant Steiner" figure. 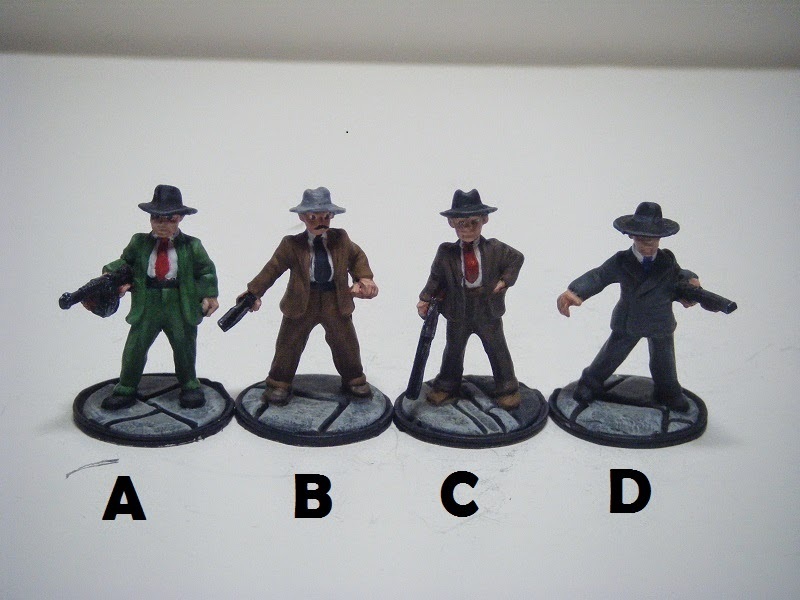 The just-primed figures are the new pack of "Named Gangsters" for my own gaming stock. Steiner just needs a little bit of touching up and a going over with some brush-on varnish. Tomorrow I have another multi-player game of FoG, this time a 25mm refight of Plataea. Evan picked up on the caption to one of my pics on Sunday and observed that I'd been reading up on the Prohibition era. He's right - I have. The Volstead Act specifically allowed individual farmers to make certain wines "on the legal fiction that it was a non-intoxicating fruit-juice for home consumption", and many did so. 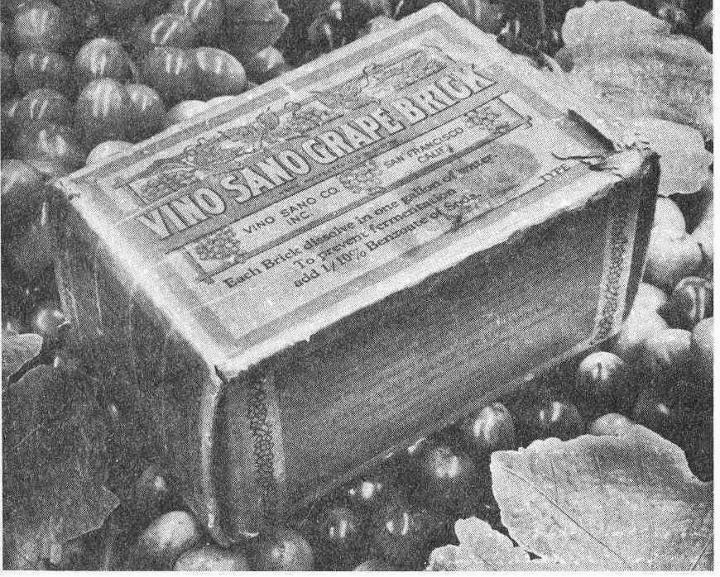 Enterprising grape farmers produced liquid and semi-solid grape concentrates, often called "wine bricks" or "wine blocks". 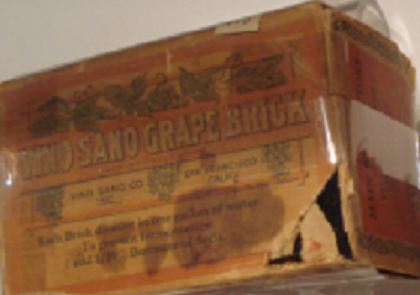 This demand led California grape growers to increase their land under cultivation by about 700 percent during the first five years of Prohibition. 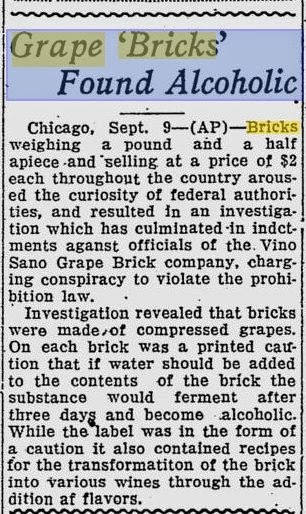 The grape concentrate was sold with a warning: "After dissolving the brick in a gallon of water, do not place the liquid in a jug away in the cupboard for twenty days, because then it would turn into wine." One grape block producer sold nine varieties: Port, Virginia Dare, Muscatel, Angelica, Tokay, Sauternes, Riesling, Claret and Burgundy. The Volstead Act allowed the sale of sacramental wine to priests and ministers, and allowed rabbis to approve sales of sacramental wine to individuals for Sabbath and holiday use at home. The Bureau of Internal Revenue maintained a list of ecumenical organizations that could be used for verifying licensure. Among Jews, four rabbinical groups were approved, which led to some competition for membership, since the supervision of sacramental licenses could be used to secure donations to support a religious institution. There were known abuses in this system, with imposters or unauthorized agents using loopholes to purchase wine. Thank goodness that jug has only been in the cupboard for 19 days. I'll remove it now so that I can't be nabbed by the G-Men for making illegal liquor! On a separate note, it would seem that my blog has become very popular in the Ukraine over the past 2 days as I've had over 2000 visitors from there. If it's a spambot, it isn't doing a very good job as none of the hits are producing referral links in the hope that I'll click through to a dodgy website. It seems that my decision on Friday night to sleep in bed rather than on the (suitably padded) floor was not a good one for my back. As a result, I decided (this time sensibly) that it wasn't perhaps a good idea to spend most of my day leaning over a gaming table to move troops, so I gave the Saga tournament a miss. There was an upside to this. It meant that I was at home when two different postmen delivered parcels for me. "Honestly officer, the barrels might say "sherry" but they just contain unfermented grape juice"
As you can see, these are much bigger than the Ford A vans which came in on Tuesday. They do look better with the 28mm figures though, but I might want to mount the figures on some lipped bases (especially as the civvies' bases are thinner and don't have the same rim as all the others) so that they don't look quite so short next to them. The other was for a Lledo "Days Gone By" Ford A taxi. Drat! Same size as the small Model A vans. My plans are foiled yet again. I'm sure the Lledo description said it was 1:43 rather than "fit the box". It's a very nice model though to join my collection of non-gaming vehicles.. The second delivery was the remainder of my Blue Moon order from Old Glory UK. The two cars are a 4-door sedan and Victoria roadster, along with a panel van (which will probably be painted up for the Police). At the back is another pack of "Named Gangsters" to replace the ones which I've already painted up as gifts. The Blue Moon vehicles look to be of a size with the Yesteryears die-casts, so there won't be a problem mixing them up for gaming. I also did a little bit of painting yesterday. I made a start on the G-Men, laying down some of the base colours. I also primed all 20 figures from the civilians pack. I'll do a bit more work this evening. Tomorrow night I'll be playing Full Thrust again. This time it is a 2500 point (un)civil war as Simon and I are both flying NSL fleets. This should be interesting. Looking ahead, it's only a few weeks until Broadside. I'll be popping down there again and hope to pick up a few useful bits for the gangster project from Fenris and Ainsty. I also hope to find someone there who has Vallejo black surface primer as my 60 ml bottle is nearly out. 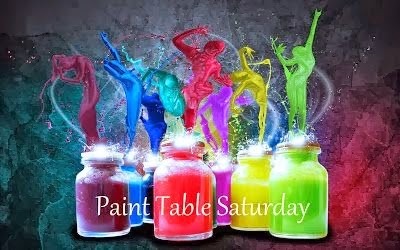 I may also pick up some 17 ml bottles of other primer colours to try out. ....to be announced very shortly. My Back - is recovering nicely. I've been doing some more figure prep this evening. All of the civilians are done and I've started work on the vehicle passengers. Ebay Orders - all my orders have been dispatched now so hopefully I'll get my grubby mitts on them in the next few days. I did order a couple of Yesteryears Ford A vans, just in case. I'm sure you understand my reasons. Oh, and I ordered one other vehicle which is essential for any city. I'll wait until it arrives before telling you what it is. Saga Comp - well, tomorrow is the comp so I'll turn up and find out if I am still needed. If I am needed to make up an even number, I'll be fielding my Normans - Bates, Fletcher, Peterson, Schwarzkopf et al. If I'm not needed, I might stick around for a bit to take some photos and have lunch then nip off to do some shopping. Anyway, that's enough drivel, you want to know who the prize winners are. In second place was Justin. His first preference was also figure A. 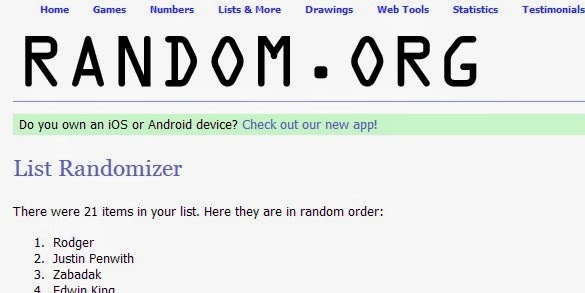 After that, he had no preference so we need to see what the third winner's choice was. In third place was Zabadak. Luckily his first choice was figure B, so he gets that one. That leaves figures C and D for Justin to choose between. Congratulations to all the winners. Can you please email me your addresses, either via my profile or using the Kontactr link below the Posties Rejects logo at the top left of the page. I will get the figures sent out to you as soon as possible.